Eindhoven, The Netherlands – Royal Philips (NYSE:PHG, AEX: PHIA) today announced that the 300th licensee signed up to its LED luminaire and retrofit bulb licensing program, which has seen its number of licensees grow by 50% since May 2012. As a result, 300 companies have access to Philips’ comprehensive portfolio of patented LED system technologies and solutions. Within the last year, the LED luminaire licensing and retrofit program has gained an impressive 100 new licensing agreements with companies worldwide. Signing up its 300th licensee is a significant milestone for Philips which is committed to driving innovation whilst creating a level playing field. Through the program, Philips – the world leading LED lighting company based on its early investments in LED technology – helps to foster the industry’s growth in its transition from conventional lamps to energy efficient LED-based lighting solutions. 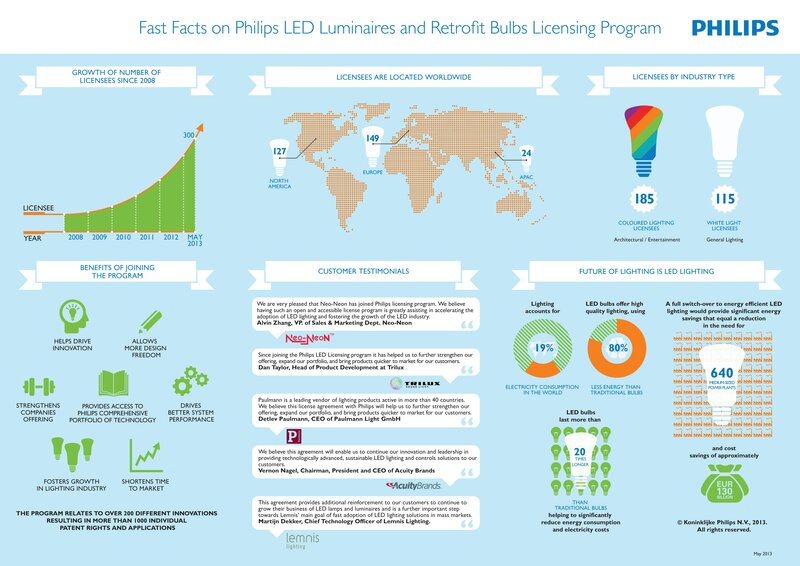 Since the launch of the Philips LED luminaire and retrofit bulb licensing program in 2008, the demand for licenses under Philips’ patented LED technologies has grown significantly with an increasing number of companies realizing the benefits and opportunities that these licenses offer to them. Through the program, licensees are given access to a wide range of basic LED control and system-level technologies available for use in their branded LED-based luminaires and retrofit bulbs for general illumination, architectural, entertainment and theatrical markets. This license agreement follows agreements between Philips and other lighting players from all industries such as Cooper, Trilux, Acuity Brands, Cree, Osram, Martin, Neo-Neon, Lemnis Lighting, Zumtobel and Paulmann. A list of licensees as well as more information about the LED luminaire licensing program can be found on www.ip.philips.com/licensing/ssl.